By David A. Morton. Published by Nolo Press. 2018. 9th ed. By David Morton. Published by Nolo Press. 2016. By National Organization of Social Security Claimants' Representatives. Published by Lexis Nexis Matthew Bender. 1984. This five volume set is a comprehensive, in-depth reference for practitioners. The major topics discussed are social security coverage, retirement and survivor's benefits, disability, supplemental security income, Medicare, fees, selected social security regulations, and medical aspects of disability. The set's medical analysis spans two volumes and covers disabilities of all of the body's different systems. By Joseph Matthews. Published by Nolo Press. 2019. 24th ed. 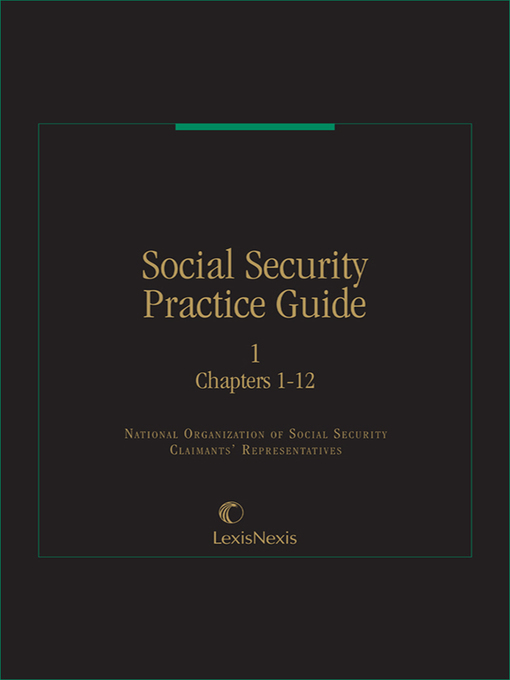 This edition is a comprehensive guide to social security benefits, Medicare & Medicaid, government pensions, and veterans' benefits. Designed to help people receive the most benefits during all stages of retirement, information is also provided about disability benefits.